A Competency Assessment Form is used to assess the competencies of an individual. In order to assess a person’s competencies, you need to identify the competencies to be assessed, who will conduct the assessment and you’ll need a defined process. The form is a tool used within this process that assessor can use to conduct and record the assessment. What Competencies Will Be Assessed? A key component of the competency assessment form is the competencies being assessed. In the sample form below you can see a leadership competency. The competency is broken down into a number of behaviours. The assessor rates each of these behaviours and provides a comment where needed to support their rating. The competencies that make up a form will typically be role based. Any one role can include a mix of technical and behavioural competencies. Some competencies are simply defined like our sample below. Others are more detailed, particularly if they are technical, to assist the assessor to make an accurate assessment. See Competency Assessment Methods for more information. Who Will Assess The Competencies? Once you’ve established the competencies you want to assess you need to determine the best person or people to complete the assessment (sometimes called a competency review). Sometimes a combination of people is used. A typical approach in many companies is for a person to complete a self-assessment with their manager also completing an assessment. One advantage of this approach is that the person needs to self-reflect in order to complete the assessment. Being able to complete this self assessment and then compare it to the manager’s assessment helps identify gaps and differences in perception. Discover more about competencies based assessment. Below is an example of a simple competency assessment template form for a small set of leadership competencies. It uses a rating scale to assess the degree of competence. A competency assessment form needs to be used within the context of a competency assessment process. This is because the process doesn’t stop with the assessment. Depending on the number of people being assessed a competency based assessment tool will be indispensable. One reason why is that you’ll have a wealth of information that you can then analyse at a group level. But beyond that planning, coordinating and managing assessments for a group of people starts to become difficult to do manually as the number of people grows. 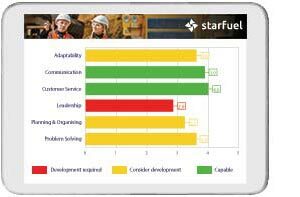 Our competency assessment software will help you profile your workforce and find your best people. Tools for HR, senior management and team leaders. Competency assessment is an ongoing process of continually building knowledge and skills. If you need to assess competencies, you’ll need a tool.